Thanks for stopping by today! I'm super excited to be the Guest Designer for this weeks Grungy Monday Challenge! For this weeks challenge, Linda has us revisiting the March 2008 Technique by Tim Holtz. Since Perfect Pearls Mists were not available when Tim showcased this technique, I thought I'd give it a go, as an alternative to creating my own. My results with the pre-made Pearls Mist resulted in a much lighter color than I was looking for, so back to the drawing board I went. I created my mists sprays using Distress Ink Refills/Perfect Pearls in Marmalade/Copper PP, Worn Lipstick /Forever Red PP, Mustard Seed/Gold PP, and Peeled Paint/Interference Green. All images are from Artistic Outpost, the birds can be found on the BlueBird Plate. Originally I had another row of birds, but since I typically cut my tags down and create cards, I cut them off. I should have cut the tag first, next time I'll remember! The beautiful house/tree image and sentiment can be found on The Outpost Plate. My fellow Guest Designer for this weeks challenge is France Papillon, be sure to stop by and see what she created! We'd love to have you play along, if you don't have all the supplies called for in the technique, try substituting similar products! I absolutely love your card. It is simply stunning. I have never thought of cutting the tag down to use on a front of a card. What a fantastic idea. I will now have to go home and check out how many i can do that for!!! I can't wait to try this technique this week!! Your card and tech's worked out just beautiful with your fav stamp set! Congrats on the guest spot! love how you used the text to add even more layers and it looks like the sun is coming up in your card :) gorgeous! Beautiful card! Love the colors. Congrats on your GM guest spot! WooHoo and congratulations, GF, for being a GD at GM! Your card is so inspiring and your misting technique is stunning! Beautiful! Another stamp set on my lists of got to gets! Happy 4th of July! THis tag card is os gorgeous! Your colors ad bright and rich! I also love the house stamp you used. Beautiful card, Lisa. Your colors are perfect! Beautiful card, Lisa. You are so good at that technique. Love it. Love your card. I have seen those stamps used many times before and always love the scenes. Your colors are perfect for this technique - the birds really show up great. Congrats on being a guest designer - you rocked this challenge. Lisa, as you always do, you've created something exceptional for this challenge, and I'm so grateful that you shared your talent as a Guest Designer for this week's Grungy Monday! Your card is just brilliant-- truly a masterpiece! Thanks for the additional info on your experiment with the new Perfect Pearls mist, too. I know that will be helpful to a lot of people. congrats on the guest DT, definitely a good choice for them as your grungy work is gorgeous! Happy 4th! Gorgeous card, Lisa! 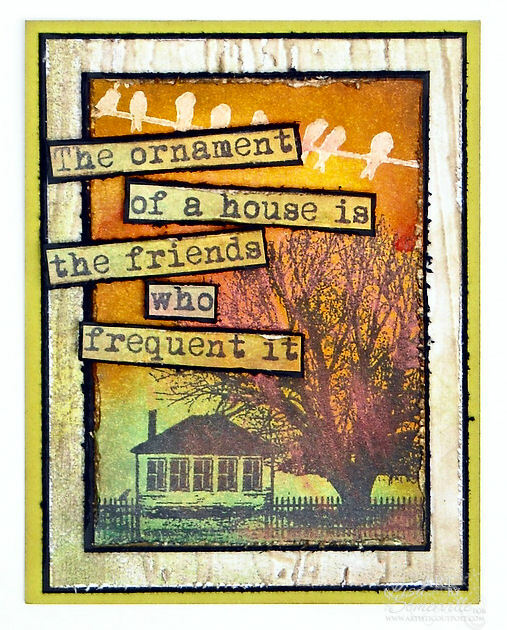 I love all the stamp layering and the rich colors. Beautiful card. Great colours and stamping. Fabulous! Love the warm tones and the layers. Congrats on your Guest Design! No surprise here! What a beautiful card and I love the sentiment! Congratulations on being the Guest Designer - hope you have a wonderful week! Love the technique and your make - very very lovely! I love everything about your card. The colours, changing tones, homely feel and the words. All combines to make a wonderful creation.